I created this map last night using the 1950's Topo Map from Historic USGS Maps of New England & NY from the Univeristy of New Hampshire and the Town of Newtown Open Space Taskforce Map to see if I could find a connection between my Burr Farm OS trail and the trail that runs north of Pond Brook after the Brook crosses under the road. 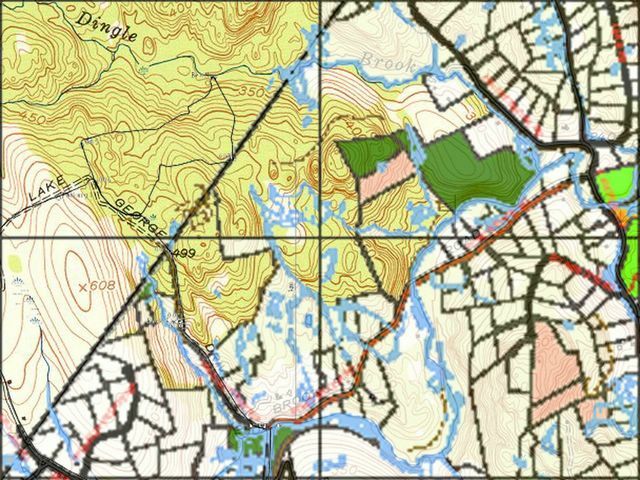 Newtown Forest Association (NFA) Lands are in dark green and Town Open Space is Pink. Over the townline, you will notice a black lines that represent the Burr Farm OS Ride that I initally mapped. You may also notice that there is some sort of road that is shown that would appear to come from the NFA land towards the center of the map and looks like a stretched out S laying on its back. It would appear that there could be connection from the Burr Farm OS loop to this logging road, into the NFA lands, and then down to Pond Brook trail and spills out to the road. Hence the purpose of this morning's ride.